Sponsor the Badgerland Softball League! The Badgerland Softball League is a 501(c)(3) non-profit and tax-exempt organization. Federal EIN 45-3984073. All sponsorships are tax deductible. The Badgerland Softball League is a sports organization comprised of Lesbian, Gay, Bisexual, Transgender, Queer, and Allied (LGBTQA) players, and supportive alliances dedicated to providing opportunity and access to participate in organized recreational and competitive softball in a safe and supportive environment. Why is Badgerland Softball necessary? LGBT players are regularly excluded from athletic opportunities and face threats of harassment, intimidation, bullying, and violence in adult athletic environments. The Badgerland Softball League seeks to change this dynamic. 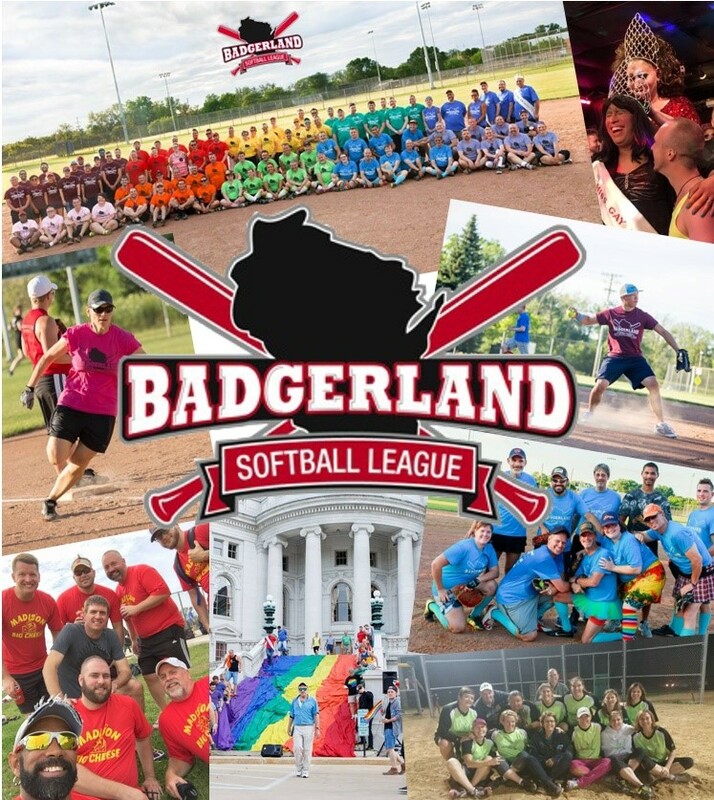 By providing what are often first-time competitive sports experiences to LGBT adults, Badgerland redefines what it means to play sports in a supportive and affirming climate. We provide positive athletic experiences that foster lifelong relationships. From our humble beginning as a single team in 2002, to the 3 league, 20+ team, 250+ member, 501(c)(3) non-profit community organization we have become today, Badgerland softball has proven its ability to survive, grow, and develop. In 2018, more than 300 LGBT athletes, friends, and family from seven states descended on Madison to compete in the Badgerland Softball Classic. The 2019 Badgerland Softball Classic will expand to feature three NAGAAA Divisions! The annual Badgerland Drag Revue serves as an opportunity to celebrate the diversity of our community while raising funds to support the league. Nationally recognized talent perform alongside players and fans from our own softball community. It is a great occasion to showcase our sponsors to hundreds of audience members. Benefits listed below. Special recognition as a Grand-Slam Sponsor for all Badgerland Softball Leagues and the Badgerland Softball Classic tournament. We will work with you to identify additional benefits to help promote your business with our players and participants of the Badgerland Softball Classic tournament. Benefits listed below. Naming your company as a Presenting Sponsor for one of our three leagues (Open-Rec, Competitive, or Women's League) or the Badgerland Softball Classic tournament. We provide a large banner with your company name and logo to hang at all fields during your chosen league or the tournament. Plus, we provide additional social media posts identifying you as a Presenting Sponsor. Benefits listed below. Naming your company as a Presenting Sponsor of one of our special events during the season: Season Welcome Party, Badgerland Drag Revue fundraiser, or our End-of-Season Awards Ceremony. An invitation to join us for the event, introduction by our Board of Directors, and opportunity to share information about your business! Benefits listed below. Naming your company as the weekly sponsor for all games during a single week, across all three leagues. We provide a special banner identifying your company as our weekly sponsor, additional recognition on our league social media pages during the week, and an invitation for you to join us that week to meet our players and community. Benefits listed below. Your company name and logo on the sponsor banner that hangs during all regular season games and a social media post on our league pages informing our community about your business and thanking you for your support. Benefits listed below. Your company's name and logo printed on the jerseys worn by every member of the league and the opportunity to include materials in our season opening gift bag (such as a business card, flyer, coupon, or promotional material). Your company's name and logo printed in our player packet at the beginning of the season as well as your company's name, logo, and a link to your company website on the Badgerland Softball website.